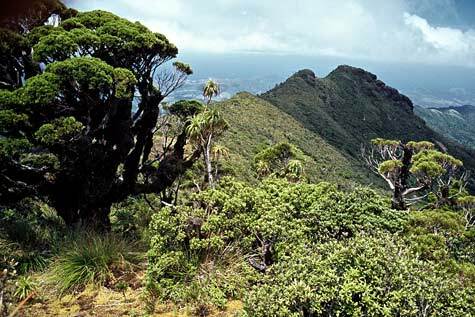 The northernmost occurrence of alpine plants in New Zealand is on Moehau mountain, in the Coromandel Range, where poor soil conditions and strong winds limit forest growth. The main peak supports a stunted cover of kawaka ( Libocedrus plumosa, left) and neinei (Dracophyllum latifolium, centre left). An exposed side peak, known as little Moehau, carries a truly alpine cover of snow daisy, snow tōtara, bog pine, bristle tussock and Kelleria dieffenbachii.